This Fox River II model features a Green Canvas Micarta handle and a full-tang A-2 tool steel blade. The Bark River Knives Fox River II offers all the great qualities of the original, but scaled up with a longer blade. 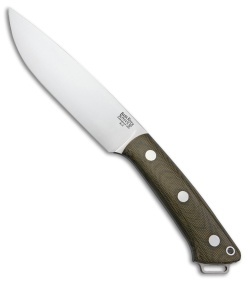 Its 5-inch blade is considered ideal for an all around camp and pack out knife for most outdoorsmen. A slightly larger and longer handle ensures perfect overall balance. Includes a handcrafted leather sheath for secure carry.